In Terms Of attended the following events during calendar year 2015. The Godfather: Screening and Artist Talk (Tom Sachs), Museum of the Moving Image, Astoria, NY. Writing and Thinking about the Critical Essay: Eric Banks, New School, Klein Conference Room, Alvin Johnson/J. M. Kaplan Hall, New York, NY. Women in Music, the Luminary, Saint Louis, MO. 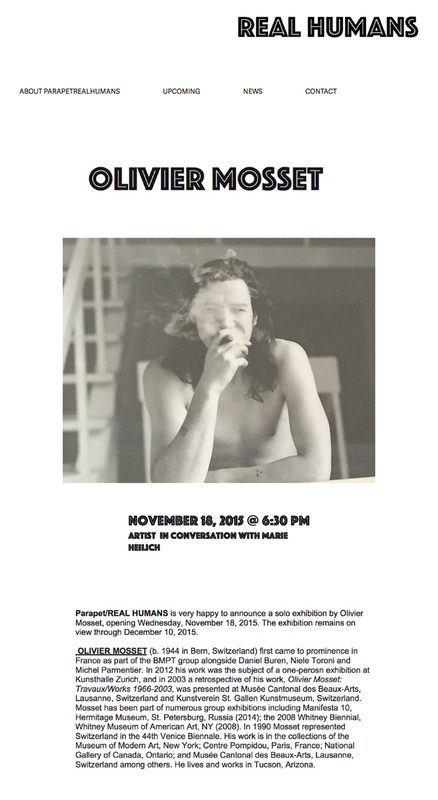 Olivier Mosset in Conversation with Marie Heilich, Parapet/Real Humans, Saint Louis, MO. Fabulated Archives, Center for the Humanities, Graduate Center, City University of New York, Room C198, New York, NY. Brody Condon, School of Visual Arts, 133/141 West 21st Street, Room 101C, New York, NY. Say You, Say Me: Art Is a Song in Your Head—Rachel Harrison in Conversation with Greil Marcus, Center for the Humanities, Graduate Center, City University of New York, Martin E. Segal Theatre, New York, NY. Fields and Praxes: Dino Zrnec and Marko Marković in Conversation, Residency Unlimited, Brooklyn, NY. 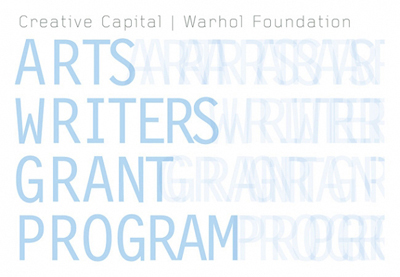 Jannis Androutsopoulos: Scenarios and Evidence of Linguistic Change, Goethe-Institute, New York, NY. Art Talk: Clarity Haynes, Trestle Gallery, Brooklyn, NY. 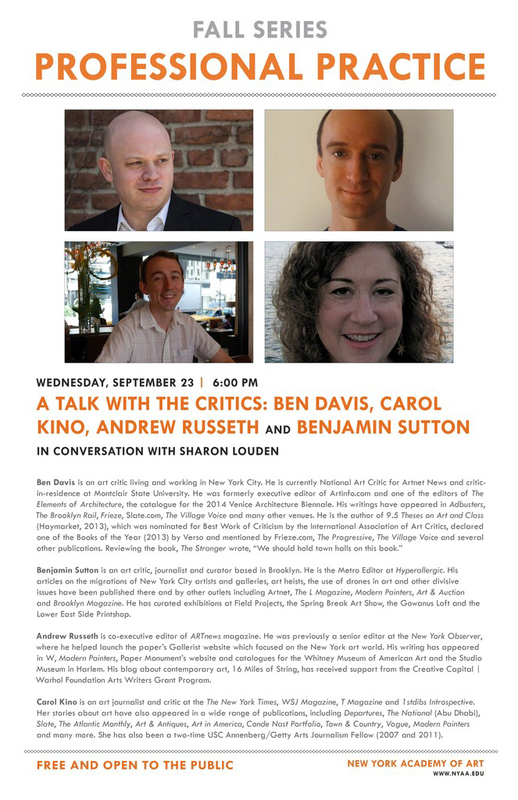 A Talk with the Critics: Ben Davis, Carol Kino, Andrew Russeth, and Benjamin Sutton in Conversation with Sharon Louden, New York Academy of Art, Wilkinson Hall, New York, NY. Spring with Dora Budor and Chrissie Iles, Swiss Institute, New York, NY. Noise Uprising: The Audiopolitics of a World Musical Revolution with Michael Denning, Interference Archive, Brooklyn, NY. Theater of Exhibitions with Jessica Morgan and Jens Hoffmann, Swiss Institute, New York, NY. Lee Lozano: Drawings and Paintings: A Conversation with Jacqueline Humphries, Jutta Koether, and Bob Nickas, Hauser and Wirth, 511 West 18th Street, New York, NY. Gendered Expectations: The Representation of “Girls” in Contemporary Art, NEWD Art Show, the 1896, Bushwick Open Studios, Brooklyn, NY. Isabelle Graw, Jewish Museum, Scheuer Auditorium, New York, NY. Freedom of Press?, Select Fair, Select Lounge, Center 548, New York, NY. “Aesthetics” of “Female” “Attractiveness,” Frieze Talks, Frieze New York, Randall’s Island, NY. Sarah Thornton in Conversation with David Kratz and Peter Drake, New York Academy of Art, New York, NY. Grimm’s Fairy Tales with Natalie Frank, Brooklyn Museum, Iris and B. Gerald Cantor Auditorium, Brooklyn, NY. Hank Willis Thomas, Art and Design Agency Lecture Series, Krannert Art Museum, University of Illinois, Urbana-Champaign. Golden Age: In Conversation at TSA New York, NURTUREart and Tiger Strikes Asteroid, Brooklyn, NY. I Will Resist with Every Inch and Every Breath: Punk and the Art of Feminism, Brooklyn Museum, Iris and B. Gerald Cantor Auditorium, Brooklyn, NY. Robert Barry, Judith Zabar Visiting Artist Lecture, 205 Hudson Street Gallery, Hunter College, City University of New York, MFA Campus, New York, NY. Tehching Hsieh, Artists at the Institute, Institute of Fine Arts, New York University, James B. Duke House, New York, NY. They Know Everything about You … : Privacy, Security, and Democracy in a Data-Driven Age, New York Institute for the Humanities, New York University, Cantor Film Center, New York, NY. Sara Kristofferson on Design by IKEA, INSIDE (hi) STORIES Lecture Series, New School, Glass Corner, Parsons East Building, New York, NY. Rhonda K. Garelick on Mademoiselle: Coco Chanel and the Pulse of History, Fashion Institute of Technology, State University of New York, Katie Murphy Amphitheatre, Pomerantz Art and Design Center, New York, NY. Did You Read That? Art Editing on the Web, College Art Association, 103rd Annual Conference, Hilton New York, Madison Suite, New York, NY. The Changing Landscape of Museums Today, Asia Society, Lila Acheson Wallace Auditorium, New York, NY. Ross Parry: The Postdigital Museum, Bard Graduate Center, Lecture Hall, New York, NY. The Artist as Debtor: A Conference about the Work of Artists in the Age of Speculative Capitalism, Cooper Union for the Advancement of Science and Art, Great Hall, New York, NY. Losing in Gainesville Release: Costello + Shapiro + Laing, Mellow Pages Library, Brooklyn, NY.